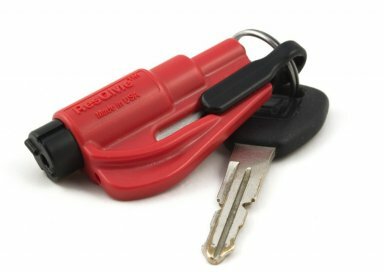 Home>ACCESSORIES > ResQMe Keychain Auto Rescue Device--Made in USA! 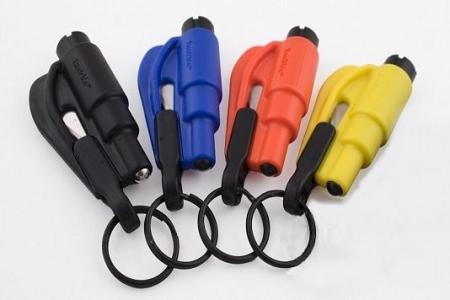 ResQME: Auto Rescue Device: This ingenious little tool which fits right on your key ring could save your or someone elses life in the event of an auto accident or emergency. Come to think of it--also a great tool when you see a pet ,or worse yet, a child trapped in a car on a hot day. ResQMe allows you to break the tempered glass quickly and easily and the built in razor knife slices through a seat belt with ease. And no, you CANNOT accidentally cut yourself--the blade is recessed for safety. Comes in several colors: bright yellow, black and red. You hope you don't have to use it, but it's there if you need it. Made in USA of course.